Parkways evolved in a very different manner than park roads, but as NPS Historian Jere Krakow has pointed out, the meaning of the term "parkway" has evolved considerably since it was coined. As a result there is some confusion about its meanings. This chapter explores some of those. The idea of parkways grew out of 19th century efforts to create beautify cities by creating grand, landscaped boulevards for the purpose of recreational pleasure afforded by walking, riding, driving carriages, and the social interaction that went along with it. Characteristics of these roads included limited-rights-of-way, careful plantings and landscape articulation, exclusion of commercial vehicles, and limited access. Often these boulevards were the approach roads to city parks, or connecting roads between them. By the end of the 19th century the concept of parkway had evolved to include the concepts of the spiritual, restful character that these green strips of nature created in the urban landscape, and the conservation of nature was key to parkway development. The use of the curvilinear roads that flowed along with the topography to expose nature to best advantage was a concept introduced in the work of Andrew Jackson Downing and Frederick Law Olmsted, also during the 19th century. The introduction of the automobile and subsequent rise in recreational driving substantially altered the concept of parkway. By 1925 Frederick Law Olmsted described the four types of roads that in his view fit the definition of parkway. They were the "elongated park" or linear park that possessed the landscape features of two parks it might connect; the "ornamental street" designed to enhance property values; any thoroughfare with a more aesthetically pleasing appearance, in a landscape sense, than an ordinary street; and finally a combination of an elongated park and landscaped thoroughfare. Thus the use of the term even by one of its originators was somewhat confusing. The Bronx River Parkway, completed in 1923, was constructed specifically for pleasure and recreational driving, and it was the first of the modern parkways. The exclusion of commercial vehicles, the use of overpasses at crossings, the use of curvilinear alignment reflecting the design speed in relation to topography, the use of planting to screen adjacent buildings, and the prohibition of billboards all contributed to its significance. Also the varying width of the entire parkway corridor created additional visual interest. The 13-mile-long road was part of a larger effort to save the Bronx River from further degradation through land reclamation, provide a park-like connector between Westchester County and New York City, and create a park on both sides of the river. A parkway could turn an abandoned wasteland into an area of scenic beauty. While the early focus of parkway design had been in urban landscapes, some of the same concepts applied in the development of more rural parkways. In January 1936, Associate Director A.E. Demaray of the National Park Service presented a paper before the council meeting of the American Planning and Civic Association in Washington. In it he gave a brief history of federal parkway legislation. Demaray discussed the first federal legislation on parkways, from the Act of May 23, 1928 which provided for the Mount Vernon Memorial Highway. The Act called for a highway connecting Washington's Mount Vernon home and the nation's capital. The legislation included provisions for the "planting of shade trees and shrubbery and for other landscape treatment, parking and ornamental structures," and a right-of-way with a minimum width determined by the commission to oversee it. Following that, congress passed the legislation for George Washington Memorial Parkway in May 1930. Two months later Congress established Colonial National Monument and included the condemnation of rights-of-way not to exceed 200 feet in width to connect Williamsburg, Jamestown, and Yorktown. In May 1934, the legislation for Natchez Trace Parkway was passed to construct a national road along an old Indian trail. 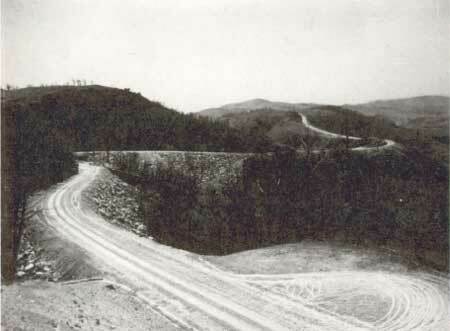 Under the National Industrial Recovery Act the first step toward actual parkway construction started after the President approved building a parkway connecting Shenandoah and Great Smoky Mountains National Park; he requested that work begin as soon as possible on the Blue Ridge Parkway. This series of roads possessed some similar legislative and design characteristics. It was designed for passenger car traffic and was largely for recreational use, aiming to avoid unsightly buildings and other roadside developments, which marred the ordinary highway. It was built within a much wider right-of-way in order to provide an insulating strip of park land between the roadway and the abutting private property. It thus eliminated frontage and access rights, and protected and preserved the natural scenic values. In other words, an elongated park was provided to contain the roadway. It was preferably located through undeveloped areas of scenic beauty and interest, and avoided built-up communities and intensively farmed lands. It aimed to make accessible the best scenery in the country it traversed. Therefore, the shortest or most direct route was not necessarily a primary consideration. Grade crossings between the parkway and main intersecting highways and railroads were eliminated. Points of entrance and exit were spaced at distant intervals to reduce the interruptions to the main traffic stream. A secondary parallel road was frequently provided to carry local traffic to an access point. 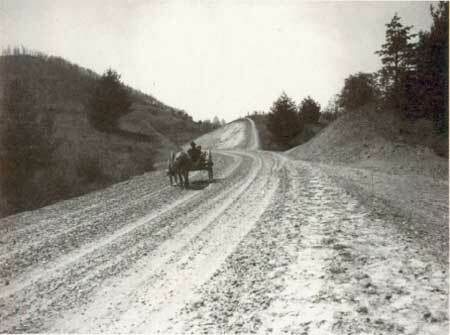 These became the standards that were applied in the development of the Blue Ridge Parkway. The Blue Ridge Parkway refined the parkway concept to the utmost. 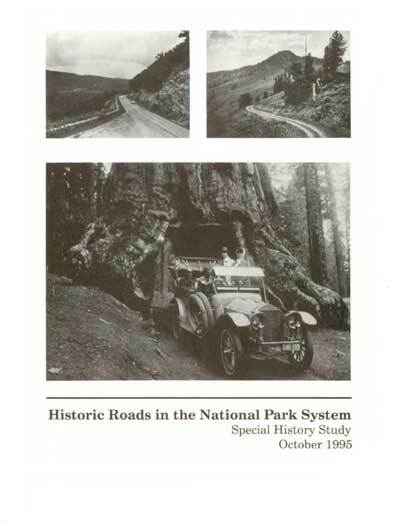 Begun in 1935 and not completed until 1984, its construction started for two principle reasons: to alleviate unemployment during the Depression; and to provide the physical connection between Shenandoah and Great Smoky Mountains National Parks. To minimize political involvement in the development of its route and to provide a framework for the parkway, designer Stanley Abbott and his team identified certain principles to guide its development. The combination of those elements in that masterful work of landscape architecture contributed to its significance, but the alignment of the road within the landscape and the, way in which it reveals the surrounding landscape may be its greatest character-defining features. Considerable confusion has surrounded the term "parkway" because of the complex evolution of the concept. Parkways evolved from two sources: boulevards with landscaped edges connecting urban parks combining with the curvilinear roads developed in nineteenth century parks that presented the landscape to best advantage. While linear in form, parkways expanded to include appropriate treatment of the natural areas through which they passed. Additional facets of parkway development is the use of the parkways for reclamation of wastelands, particularly when it is developed as an urban connection. Federal involvement in parkway design honed some of the legal tools for acquisition, design development, and management of parkways. Many of the design principles developed for parkways were later applied in highway and interstate development.